Barbie fans are gonna love this one! Pretty Pets Barbie® loves to bring her furry friends to the Mega Bloks® Barbie® Build ‘n Style Pet Shop for a “pet-icure”. Treat each pet to a shampoo followed by stylish grooming make-over. Show off the pets’ tail-wagging looks in the moving pet shop window seat! Just love this toy! It’s adorable and fun for a mix of creativity and building that girls will just adore! It’s aged at 4+ and retails for $24.99. 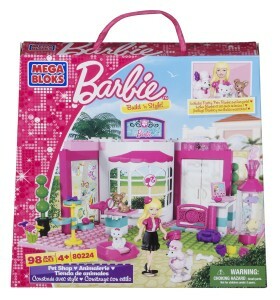 Mega Bloks® Barbie® is a new line that only just hit store shelves in December 2012! One winner will be selected at random after February 18th. Great giveaway, girls like to play with blocks too! I love this!